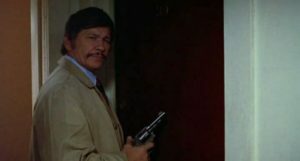 Star Charles Bronson (Murphy’s Law) and director Michael Winner (The Mechanic) team up for one of their six cinematic collaborations in the 1973 action-filled crime drama The Stone Killer. This one is the tale of a tough cop (Bronson) up against a Mafia plot to avenge a decades-old massacre. The twist: the Don (Martin Balsalm) is using Vietnam vets as his hit men. John Gardner’s book was adapted by Gerald Wilson, and the score is from Roy Budd.